The smell of toasted coconut wafted through my nose as I opened my jar of homemade latik. It instantly whetted my appetite for the freshly baked biko [bee-koh] sitting on my kitchen counter. I had been waiting for the rice cake to cool and I couldn’t wait any longer. While coffee dripped down my hour-glass-shaped coffee maker, I excitedly grabbed plates and forks. I sliced through the cake’s beautiful caramel top and could smell the fragrant pandan, which thrilled me even more. 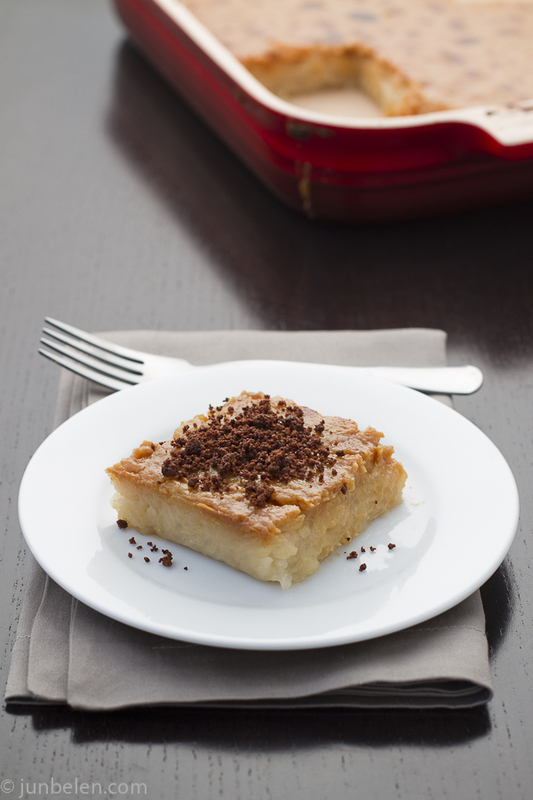 I sprinkled the crunchy bits of latik on top and poured myself a cup of coffee. Crunchy toasted coconut milk crumbs. Rich caramelized coconut milk. Sweet sticky rice. With every bite, I drifted away into pure bliss. 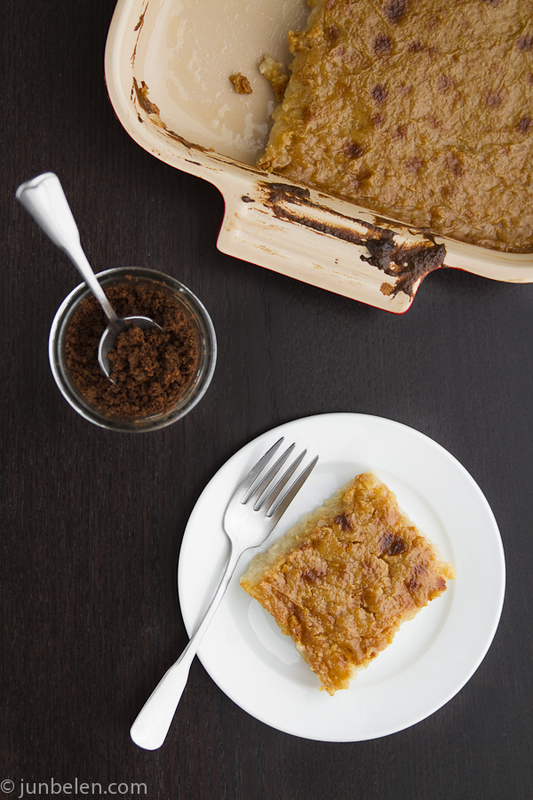 When I think of biko I think of my mom and our forays to the market together when I was a kid. After we methodically meander through the market’s maze of stalls and stuff our bags with whole fish, butchered pork, and fresh produce, we would stop by our favorite kakanin vendor and buy rice cakes for everyone back home — biko, puto [poo-toh], maja blanca, [ma-hah blang-ka] or sapin-sapin [sah-pin sah-pin] — all nestled in coconut oil-lined banana leaves in wide, shallow bamboo baskets called bilao [bee-la-oh]. A plate brimming with sweet rice cakes was a permanent fixture on our kitchen table on Saturday mornings. It was always something to look forward to every weekend. And it still is. For my homemade biko, I took Gerry Gelle’s recipe and added pandan for flavor and molasses for color. The rice cakes are simple to make and go incredibly well with homemade latik. Serve them with coffee or à la Mode with coconut ice cream. Preheat oven to 300 degrees F. Generously butter an 11 by 7-inch baking pan and set aside. Mix coconut milk, water, and pandan juice in a large pot. Add sticky rice, bring to a boil and simmer over medium to low heat, stirring constantly to keep rice from burning. Simmer until rice is almost dry, around 15 to 20 minutes. Turn the heat off and add brown sugar and butter. Pour the rice into the pan. Spread out evenly and bake for 20 minutes. Meanwhile, mix condensed milk, coconut milk, molasses, and pandan juice in a saucepan. Cook over medium to low heat, stirring constantly until it thickens like jam, around 30 minutes. Take the rice out of the oven. Increase the temperature to 350 degrees F. Spread the caramel topping evenly and generously over the rice and bake for another 15 minutes. Turn the broiler to low and brown the top for a few minutes. Serve the cake cut in squares and sprinkled with latik or à la Mode with coconut ice cream. I followed your recipe and it was a success! We ate half on the same day and the other half was kept in the freezer for a week and it tasted even better. Thanks for the recipe! 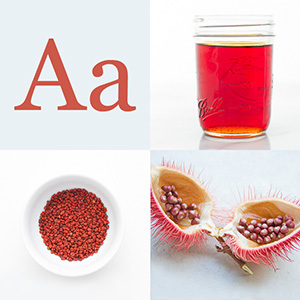 I followed this recipe using black glutinous rice. Was the rice supposed to be soaked? I did not see that in the directions or I guess I didn’t realize it had to be treated differently. Now, I have a pan of undercooked biko. Is there any way to fix this? Anna, thank you for trying the recipe. It looks so good! Anna, there is no need to soak the rice before cooking. You just need to let it simmer on the stovetop and bake it in the oven. My guess is that black glutinous rice needs longer time to cook. I’m not sure if this is the same thing but it looks the same. A Filipino lady at work gave me a slice of what she called sticky rice & it was beautiful.